Wir bieten sowohl vor Ort am Institut in Grenzach-Whylen (direkt bei Basel) und online Kurse der TRANSCEND Peace University an. Acquire the Galtung-Institut´s Conflict Transformation Specislist Certificate: Become a professional mediator & conciliator for international & geopolitical conflict formations. 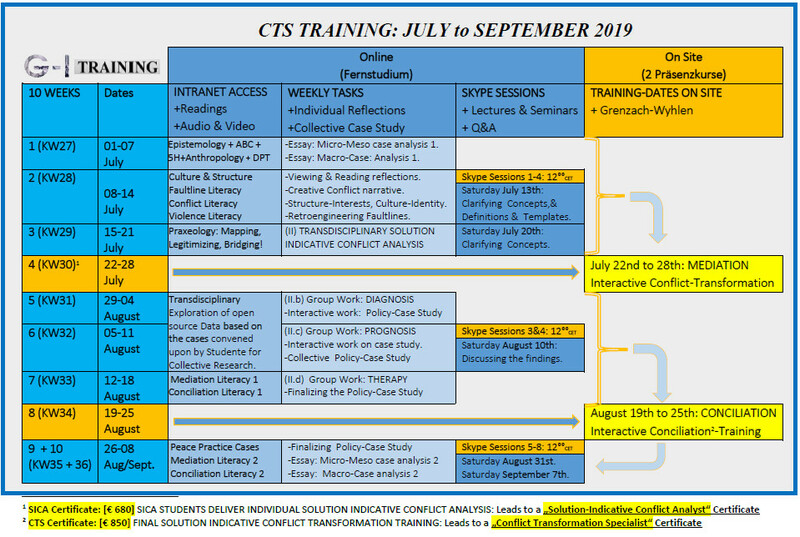 This training was originally created for the United Nations Disaster Management Program by Prof. Johan Galtung and is designed to train participants in becoming conflict-transformation specialists with sophisticated & actionable mediation-skills. The course combines online and onsite courses that must be completed for the certificate. Zur Zeit werden leider keine Online Kurse angeboten.